The Rhode Island women’s track team had a really great meet at Bryant University this weekend and look like they have a team that could be just as strong as, if not stronger than, the one that came in second place in the Atlantic 10 Championships during the indoor season. One event where the team really excelled was in the relays, as they won both the four by 100-meter relay and 4×400-meter relays. It could be a special outdoor season for the men as usual, but the women’s team should be given their due as well. They could be great, too. There was a cool story featuring former Rams baseball player Jeff Roy, who developed a friendship with local youngster Braylon O’Neill. O’Neill met Roy after he caught the former URI slugger’s attention crushing some batting practice, despite the fact he had a prosthetic leg. Both are from Cranston, Rhode Island, and have developed a special bond, which has resulted in O’Neill taking pictures with some Pirates celebrities, taking batting practice with them and hanging on the field; a classy gesture of giving back to his home town. 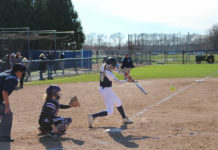 Tough game against Dayton for Rhody women’s softball team. They fell behind 2-0 after one inning, only to fight back and knot it up at two in the second inning. However, that lead was short-lived as the Flyers would score seven runs in the third and fourth innings combined, giving them a 9-2 lead and ultimately a 12-5 win. Â The loss undoubtedly left a sour taste in their mouth. Unfortunately, the rain cancelled the doubleheader with the Flyers on Saturday, meaning there were no chances to make up for it. 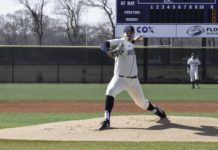 Tough weekend for URI men’s baseball and women’s softball as the weather disrupted both teams’ chances for some victories this weekend. 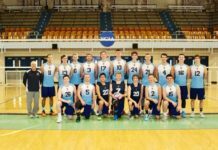 Both teams saw their weekend doubleheaders cancelled versus the University of Massachusetts and Dayton University. DeAngelo Berry (Black and Gold Invitational) – Berry was a man on a mission on Saturday winning the 100-meter and 200-meter dashes, while also being part of the quartet who won the 4×100-meter relay. Ali Summers (12-5 loss vs Dayton) – The junior continued her torrid stretch as she reached base safely for the 16th straight game on the power of her solo homer. She also added a sacrifice fly in the seventh inning. It was her first multi-RBI game of the season. Team of the Week: URI women’s track (Black and Gold Invitational) – The women proved they can churn out top notch performances with eight winners in their respective events, including seven of the top 11 in the 400-meter hurdles. Off the Record: Â The Celtics clinched a playoff berth with their victory over the Lakers at the Staples Center. Isaiah Thomas averaged 25.9 points per game in March, his highest average in a month this year in which he started at least one game. He also shot 42 percent from 3-point territory, his highest in a month by five percentage points.